Racing and Orange County (NY) go hand in hand. No speedway in the region or in the WORLD has as much history behind it as Orange County Fair Speedway! It is the oldest dirt track, which has been operating continuously, in the United States. This track has survived depression, wars, hurricanes, and calamities that would have sunk other enterprises. Last night, she played host to the World of Outlaws STP Sprint Cars. In the process she wrote another page of her history and an important page for second generation driver Kraig Kinser. The Outlaws took to the hard clay track 23 cars strong with three-time NASCAR Cup champion Tony Stewart in the field. He was driving his own Chevrolet Performance/Bass Pro Shop No. 14. The track record of 16.083 held by Joey Saldana was set in September 2008. The record would stand and quick time was set by Stewart with a lap of 17.027 or 132.143 mph. The remainder of the top five were Paul McMahan, Joey Saldana, Donny Schatz and Chad Kemenah. The short field called for three heat races with everyone transferring to the A Main and eliminating the need for a Last Chance Showdown. The first heat race was dominated by World of Outlaws point leader Daryn Pittman who crossed the line in front of Donny Schatz, Jessica Zemken, Tony Stewart and Steve Kinser. The race was a battle from fifth on back with Steve Kinser holding school on how to work the top of a slick, hard clay surface. Pittman, Schatz and Stewart would all transfer to the Dash. The second heat race would go to PA Posse member Ryan Smith with Cody Darrah coming hard at the line. Paul McMahan and Chad Kemenah would settle the battle for third at the line with McMahan coming in on top. Smith, Darrah, McMahan and Kemenah would all transfer to the Dash. The third heat was a battle between old school and new school heroes. Sammy Swindell would jump to the lead early and would cross the line 2.7 seconds in front of Joey Saldana, Justin Henderson and Kraig Kinser. Kraig Kinser, Sammy Swindell and Joey Saldana would transfer to the Dash. The Dash inversion was a six (6), which put Kraig Kinser on the pole. It was a hard fought six laps that was action packed from the drop of the green flag. Chad Kemenah would jump to an early lead over Kraig Kinser. Donny Schatz and Tony Stewart would battle all the way to the checkers for third place with Stewart coming home with the spot. With the top 5 rows of the A Main set, this event was next on the card. The 25 lap A Main was contended from second back. Kraig Kinser would jump to the lead and hold it for the entire 25 laps. The battle for second raged between Donny Schatz, Tony Stewart and Chad Kemenah. In the course of five laps, the third spot changed hands between Stewart and Schatz six times. After making a pass on the bottom of the track, which was the preferred line, Stewart moved to third and brought Paul McMahan with him relegating current champ Schatz to fifth. Stewart would close on Kemenah attempting to make a high side pass on the final lap out of Turn 4; however, Kemenah would block to protect the spot, holding on to second. Stewart would come home third. Paul McMahan would cross the line in fourth with Schatz coming home a very close fifth. At the line, there was less than four car lengths between second and fifth. 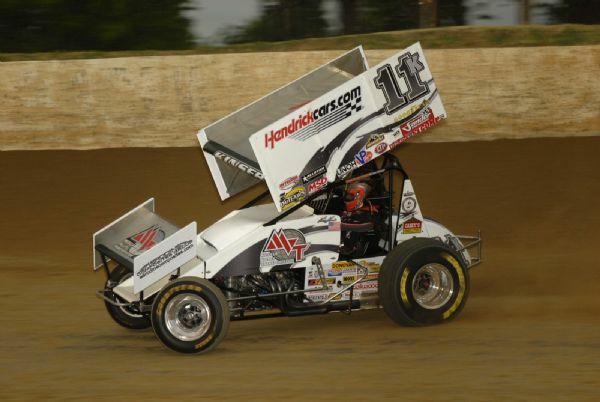 The KSE Hard Charger of the race was Steve Kinser who was the defending champion of the race. Kinser would advance four spots from 16th to 12th. Kraig Kinser would finish with a two second lead on the field. They say that history and time are fluid and that they run like a river. Last night, it ran like a fast moving stream of rapids with Kraig Kinser navigating it perfectly. The very quick and short night will leave a lasting memory on the young man from Bloomington, Indiana whose family history often over shadows his talent and ability. But last night it was the son not the father that showed the way and led the ship through the rough waters of the oldest dirt track in the country - Orange County Fair Speedway. Heat 1 - (8 Laps - Top 6 finishers transfer to the A-feature): 1. 9-Daryn Pittman ; 2. 15-Donny Schatz ; 3. 1Z-Jessica Zemken ; 4. 14-Tony Stewart ; 5. 11-Steve Kinser ; 6. 1S-Logan Schuchart ; 7. 13-Jason Leffler ; 8. 6R-Bill Rose . Heat 2 - (8 Laps - Top 6 finishers transfer to the A-feature): 1. 69-Ryan Smith ; 2. 4-Cody Darrah ; 3. 51-Paul McMahan ; 4. 63-Chad Kemenah ; 5. 7S-Jason Sides ; 6. 5-Justin Barger ; 7. 6-David Gravel ; 8. 1A-Jacob Allen . Heat 3 - (8 Laps - Top 6 finishers transfer to the A-feature): 1. 1-Sammy Swindell ; 2. 71M-Joey Saldana ; 3. O7-Justin Henderson ; 4. 11K-Kraig Kinser ; 5. 7-Craig Dollansky ; 6. 29-Kerry Madsen ; 7. 28F-Davie Franek . Dash - (6 Laps, finishing order determined first 10 starting positions of A-feature): 1. 63-Chad Kemenah ; 2. 11K-Kraig Kinser ; 3. 14-Tony Stewart ; 4. 15-Donny Schatz ; 5. 71M-Joey Saldana ; 6. 51-Paul McMahan ; 7. 9-Daryn Pittman ; 8. 4-Cody Darrah ; 9. 1-Sammy Swindell ; 10. 69-Ryan Smith . A-Main - (25 Laps): 1. 11K-Kraig Kinser  [$10,000]; 2. 63-Chad Kemenah  [$5,500]; 3. 14-Tony Stewart  [$3,200]; 4. 51-Paul McMahan  [$2,800]; 5. 15-Donny Schatz  [$2,500]; 6. 9-Daryn Pittman  [$2,300]; 7. 4-Cody Darrah  [$2,200]; 8. 71M-Joey Saldana  [$2,100]; 9. 69-Ryan Smith  [$2,050]; 10. 1-Sammy Swindell  [$2,000]; 11. 7S-Jason Sides  [$1,500]; 12. 11-Steve Kinser  [$1,200]; 13. O7-Justin Henderson  [$1,100]; 14. 29-Kerry Madsen  [$1,050]; 15. 1S-Logan Schuchart  [$1,000]; 16. 5-Justin Barger  [$900]; 17. 1Z-Jessica Zemken  [$800]; 18. 7-Craig Dollansky  [$800]; 19. 6-David Gravel  [$800]; 20. 13-Jason Leffler  [$800]; 21. 6R-Bill Rose  [$800]; 22. 28F-Davie Franek  [$800]; 23. 1A-Jacob Allen  [$800]. Lap Leaders: Kraig Kinser 1-25. KSE Hard Charger Award: 11-Steve Kinser [+4].